Selena Li (李施嬅), Shaun Tam (譚俊彥), Rebecca Zhu (朱晨麗), Patrick Tse (謝賢) and Michelle Yim (米雪) were at the blessing ceremony for TVB’s upcoming series Forensic Heroes 4 <法證先鋒IV>. The producer praised Patrick for his natural acting, but Patrick humbly responded that he feels a little rusty as he has not filmed in a long time but is very happy that everyone has been so welcoming. Selena portrays a forensic scientist in the drama and exclaims that it is already her fifth overnight shift filming the post- mortem examination of the corpses. She praised the actors that have to act as corpses for their professionalism as no matter if it is a male or female, they still had to take off their clothes for her to “examine”. The late night filming has been taking a toll on Selena as she has low blood pressure leading her to feel dizzy. Raymond also agreed that filming for this drama has been very tiring as they have many long dialogues with professional jargon. With boxing scenes in her sports bra, Rebecca has been dieting in order to look her best. However, Shaun recently invited her to try his new restaurant and she could not resist the temptation of good food. The restaurant is in the midst of a soft opening and will be slated for the grand opening at the end of the month. Due to the fact that they had not hired a chef until recently, Shaun had been taking on the role of going to the market for ingredients and cooking; all with his son in tow! Rebecca praised Shaun for being a wonderful husband, father, and boss and that she found all his qualities very attractive. Wow a man who can cook well enough to open a restaurant is indeed very attractive! Selena looks botoxed. is it just the photo? @mike Botox is widely used in the entertainment industry; it’s considered to be a very casual procedure. If 24-year-old Crystal Fung admitted to using botox, it wouldn’t be surprising for Selena to use it too. 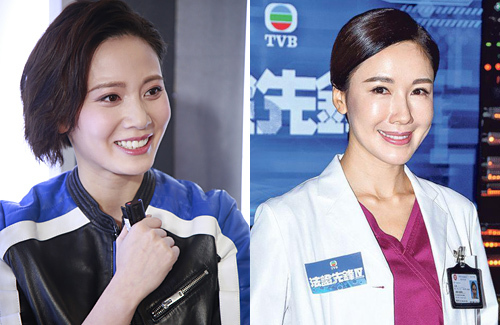 Btw, Rebecca Zhu likely used botox to relax her jaw muscles and create the appearance of a slimmer jawline (you can Google her Miss Hong Kong photos where she looks a lot different than now) rather than jaw surgery since it’s more invasive.